There’s a good chance you love a cup of coffee to kickstart your day – but have you ever used it in your beauty regime? Believe it or not, coffee has the amazing ability to tone your skin and reduce cellulite. Use it as a base ingredient in a homemade scrub to reap the benefits. The caffeine in coffee acts as a diuretic. This means it encourages the body to release excess fluid, thereby reducing puffiness. According to research published in Skin Pharmacology and Physiology, it can also reduce the amount of fat in skin cells. Therefore, it’s a powerful weapon against cellulite when rubbed into the skin. Coffee also contains antioxidants. These chemicals offer numerous benefits. They encourage the body to break down toxins, increase blood flow, and preserve collagen. The result? Healthier, smoother-looking, and more youthful skin. Coconut oil makes a scrub easy to apply and nourishes your skin. Research shows that, just like coffee, coconut oil contains skin-friendly antioxidants that protect against toxins and premature ageing. You can use coconut oil all over your body and it’s suitable for every skin type. Olive oil is also nourishing but can be too greasy for oily skin. The coarse texture of brown sugar helps exfoliate the skin and boosts circulation. The smell of cinnamon is uplifting and energizing. It has antibacterial properties that reduce the appearance of acne. It may also reduce fine lines, giving an antiaging effect. 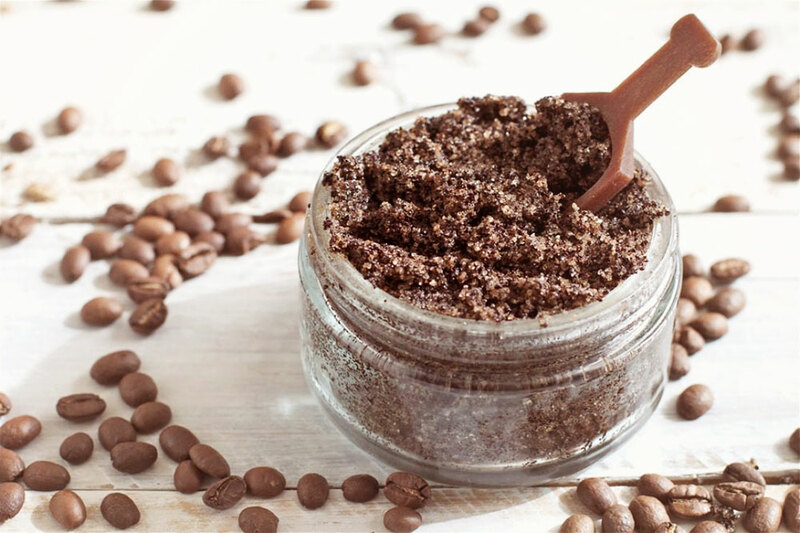 1) A super-simple DIY Coffee Scrub recipe: Just mix coconut oil and ground coffee beans in a 1:1 ratio. 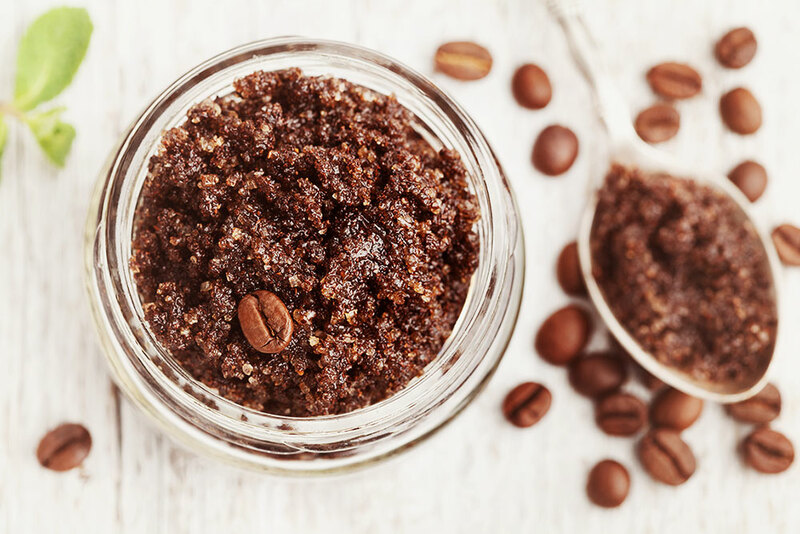 2) Sugar and coffee scrub: Mix together 1 cup brown sugar, ¾ cup olive oil, and ¼ cup ground coffee. 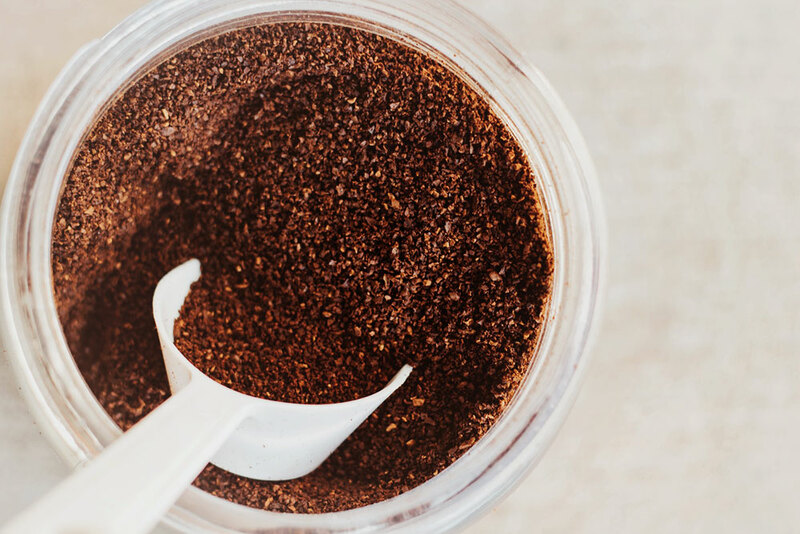 3) DIY Coffee scrub with cinnamon: Mix together ¼ cup brown sugar, ¼ cup coconut oil, ¼ cup coffee grounds, and ½ tablespoon of cinnamon. 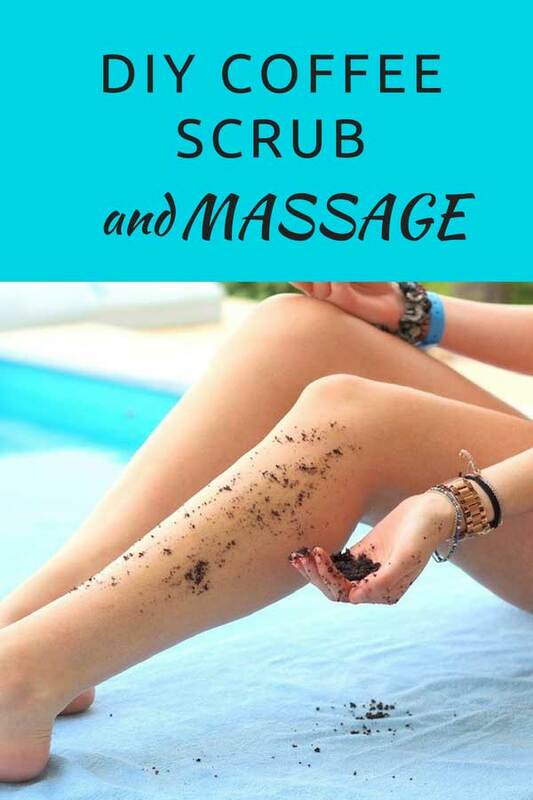 1) Use it to give yourself an anti-cellulite massage: Massage the scrub into affected areas using firm, circular strokes. If you are using a scrub with cinnamon, don’t let it sit on the skin for more than ten minutes. 2) As a regular exfoliant: A scrub that contains sugar will help get rid of dead skin. Use it in the bath or shower a couple of times per week. Use approximately one tablespoon per leg or arm. Use medium-firm pressure to apply it in circular motions. 3) As cool exfoliant cubes: If you have made a scrub with coconut oil, you can freeze it into cubes. This reduces waste and is also a fantastic treat on a hot summer’s day. Simply place tablespoons of the scrub in muffin tins, freeze, then put the cubes in freezer bags. Rub the cube over your skin in the bath or shower for a refreshing experience. 4) As a foot scrub: It’s easy to overlook your feet, but they deserve attention! 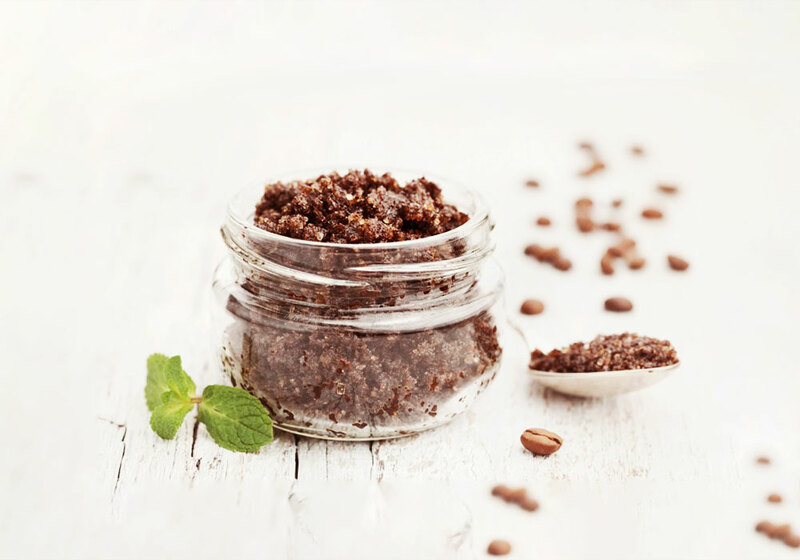 A coffee scrub will leave tough skin and calluses feeling softer. It will also increase blood flow to your feet. This is a godsend if they are aching after a long day’s work. If you happen to have a partner around, why not ask them for an extra-special foot rub? 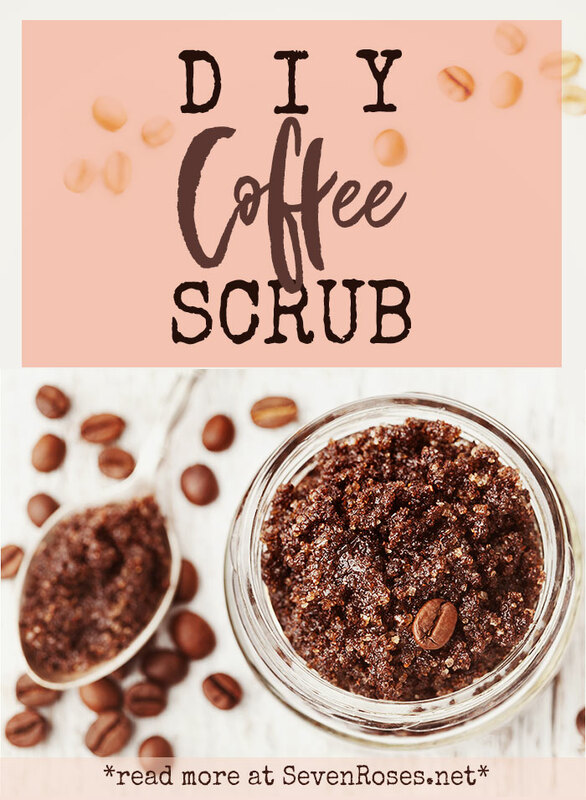 Coffee scrubs are relatively harsh, so it’s best to limit your use to twice per week. The ingredients in the recipes above don’t cause allergic reactions in most people. However, it’s still a good idea to do a patch test 24-48 hours before using the scrub all over your body. You should also remember that coffee can stain towels and clothes. It’s best to use scrubs in the shower so you can wash the grounds away. If you are using coconut oil in your scrub, be warned that it can clog drains if allowed to harden. The best way to prevent this is by runnin le getting it out of your hair, apply one raw egg beaten and mixed with water. Rub it into your scalp and rinse thoroughly with warm water. It’s summertime – and that means dresses, skirts, and shorts! But what if the prospect of showing off your legs fills you with dread? You aren’t alone. Lots of us feel self-conscious about showing extra skin. Luckily, you can boost your confidence – and the health of your skin – with a couple of DIY techniques. Get an anti-cellulite massage: Most of us have cellulite, but that’s little comfort when you see it in the mirror. According to WebMD, cellulite is fat that pushes against connective tissue. This causes that all-too-familiar dimpling effect. So, what can you do about it? Fortunately, massage will improve the look and feel of your skin. You can get an anti-cellulite massage at most spas and salons, or you can do it at home. Start by placing a small amount of oil onto your hands. Almond and coconut both work well. Using firm pressure, massage your skin in circular motions in the direction of your heart. Don’t just massage the most dimpled areas. Some cellulite is harder to see, so it’s best to massage a few inches around it. Use your knuckles for extra-deep pressure. Get a fake tan: Cellulite is harder to see on darker skin. If you have pale skin and feel self-conscious about your cellulite, book a tanning treatment. It will also cover up blemishes, rough patches of skin, and other imperfections. Stimulate your lymphatic system: Self-massage can speed up lymphatic drainage, improving your health and making your skin glow. Start by applying a few drops of diluted essential oil to your legs. Next, use the brush to apply long, firm strokes upwards, towards the heart. To make sure you don’t miss any areas, begin at your feet and work up to your thighs. Try dry brushing for four or five minutes each morning. Take care of those red bumps: Do you have patches of dry red bumps on your legs? This condition is known as keratosis pilaris. It’s harmless but can be unsightly. The bumps are caused by an excessive build-up of keratin, a protein that normally shields skin from microorganisms. The good news is that it often improves in summer. The bad news is that this can take a few weeks. In the meantime, dry brushing and using moisturizer can make it less obvious. Reduce inflammation by avoiding hot showers. Never pick at the bumps, as this will only make them red and sore. If your skin is very itchy or looks infected, see your doctor. Banish bloat: Your legs can retain water and become puffy, which makes them look larger. Cutting down on salty food and alcohol will help. Drink lots of water to encourage lymphatic drainage. Learn how to contour: We all know that contouring can slim down your face, but did you know it also works on legs? Apply a few strokes of bronzer to the tops of your thighs and shins. This draws the eye inwards and gives a slimmer appearance. Refine your hair removal strategy: If you shave your legs, have a shower and exfoliate first to remove dead skin cells. This helps prevent post-shaving bumps and ingrown hairs. Use plenty of shaving lotion and always shave upwards before reversing the razor to pick up any remaining hairs. If you prefer to wax, make sure you know how to get the best from your treatment. First, make sure your hair is at least 1.5 millimetres long. If you haven’t had a wax before, bear in mind that your skin might be a little red or irritated. It’s best to have a wax a couple of days before making a public appearance in a leg-revealing outfit. Exfoliate a couple of days before getting a wax. This removes dead skin and will give a smoother finish. The same principle applies to getting a fake tan – exfoliation will prevent a blotchy appearance. A good beauty salon will also carry out a patch test before giving you a full treatment. This will identify any potential for allergic reactions to wax or tanning solution. Prefer to use a DIY kit? Always be sure to read the manufacturer’s instructions before starting. Exfoliate beforehand, do a patch test, and ensure you have enough hair to “hold” the wax. Avoid waxing if you are emotionally distressed, because your pain threshold will be lower according to beauty expert Rhona Shupe. With these tips in your back pocket, you’ll have fabulous, beach-ready legs within hours. Enjoy your summer! Wow! I love coffee and drink it daily, never seriously thought it can do so much. Really would like to try this out, I’m sure this will help me to feel so much better afterwards. Love this info! Cheers.